Sculpt Tank fans will be glad to know five new colors have been uploaded. This tank has been gone since late summer. Other than those two items nothing else is popping out at me. I was hoping the Peacock Think Fast Hoodie would be uploaded but I guess it's not meant to be. Well that was a lame upload, not sure why they bothered. We didn't even get any WMTM this week. Was hoping for the berry restless pullover and that peacock think fast sure would've be nice. Align pants in the email with no new size 2 or 4 online?! Wth?! She is rocking that dress!! I wonder if the & Go long sleeve dress has the same problem as the short sleeve one did-the pockets on the side stuck out horribly. I love the long sleeve, but I'd definitely like to try it on first. That was one of the lousiest pre Xmas uploads I have ever seen. What happened to the promised uploads 2x week?? Alsop no new wmtm items in weeks. Do they not want my money?? 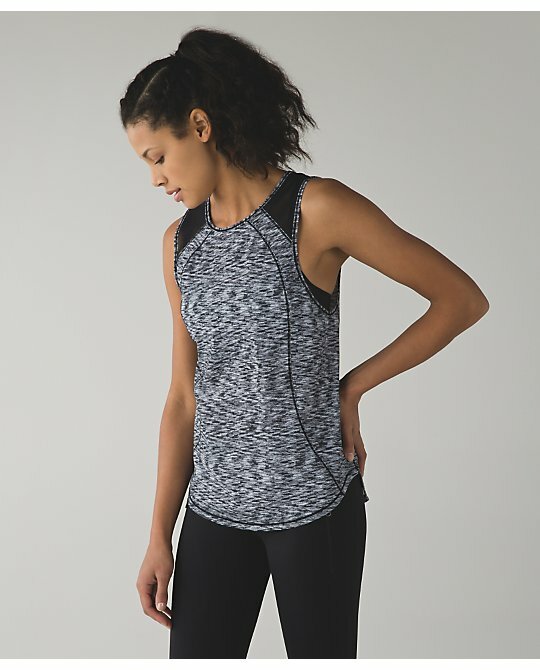 @OttawaLuluLover - lululemon muting WMTM is standard operating procedure for them. My store got rid of their markdown racks a couple of weeks ago. They'll come back out for shopping on December 26th. This Xmas season has been a terrible disappointment. They did fire the head of product development, Tara Posley, so I would think we could assume the crappy holiday offerings must be one of the reasons why. I too would've thought the uploads pre Christmas would have been more exciting but nothing really at all! Sad. Despite the less than ideal offering, I somehow managed to spend more $$$ than last year I think. My wallet needs a break! Caved and ordered the dress... Couldn't really find good info on what size to order (I'm all over the board... 2 in CRB, 4 in most looser-fit LS items & in short-sleeve items, 6 in bras/bra tops/tight-fitting LS, 4 in bottoms... freaking Lulu sizing nightmare right here, LOL! ), but I ordered the 4 seeing as most people said to size down to your smaller size in the short-sleeve &go where-to dress. Fingers crossed it works! Really wish they would have a PER-ITEM size chart... at least for dresses. Tried on two dresses today at the Eaton Ctr in Toronto. I'm 5'5" 110lbs, and wear size 4 in almost everything lulu. The & where to LS dress was purchased in size 6. The size 4 was perfect and form fitting, but I prefer a have a relaxed fit. There was absolutely no side puckering of the dress, like that found in the short sleeved version. Yay! The & Go 'Til Dawn dress was purchased in size 4. It was fotted with just a smudge of wiggle room. The dress was also forgiving in the midsection and very flattering. Tried on the size 6 as well, but the arms gaped open too much and there was a little excess material on the back of the dress. Hope this helps anyone considering either dress. The & Go 'Til Dawn was stunning and a definite purchase. Lol! "Fitted with a smidge of wiggle room" Darn autocorrect. Pls excuse all the other errors!